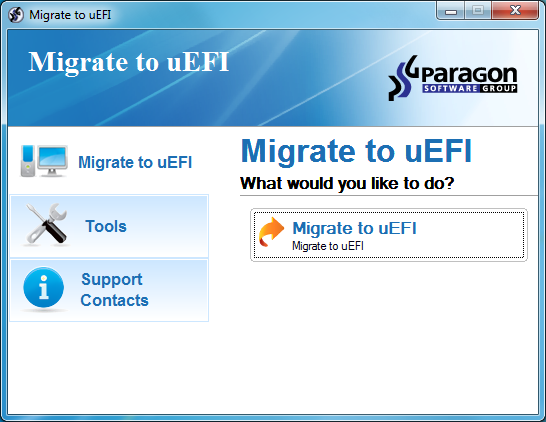 Paragon Migrate to UEFI is a simple four-step wizard which makes it relatively easy to migrate your 64-bit Windows Vista/ 7 system to a GPT/ UEFI setup. What does this mean? Using the new technologies will allow you to boot from large disks, specifically drivers greater than 2TiB in size. The old BIOS setup program gets replaced by a far more sophisticated pre-OS environment, including network support. Boot time is faster, too, and there are plenty of more technical benefits. This isn't for everyone, though. You'll need an operating system which can boot from UEFI, like 64-bit Windows Vista or 7. Your motherboard must support UEFI, too. And you'll need a second hard drive to hold the new setup. Of course if you have all this then you could set up your system manually, but you'll have to start from scratch, installing Windows, all your applications, then reconfiguring them to work as you need. Paragon Migrate to UEFI simplifies this process, though, by copying your existing system to a new drive (complete with a new GPT partitioning scheme), and automatically adjusting Windows to start up in UEFI mode. All you really have to do is point the program at the source and destination drives, and it'll take care of everything else. That's the theory, at least. Migrate to UEFI is being made available under Paragon's Early Adopter program, though, which means the program you're getting is a pre-release version: a good beta, if you like. It should work just fine, but as it's free, and pre-release, there are no guarantees. Make sure any system where you use it is fully backed up, and check the new installation carefully, once the migration has finished, to make sure that everything is working just as it should. Please note, while you can download Paragon Migrate to UEFI from the link here, you must complete the form at Paragon's site to check out the Early Adopter Agreement and receive your product key and serial number. If you're looking to move to a UEFI-based system then there's no need to reinstall everything from scratch; Paragon's Migrate to UEFI can create a properly formatted copy of your system drive with the minimum of hassle.